Apparently it's possible for the Blogger.com editor to eat an entire post. I know this because it just happened. (sigh) I think after this I'm going to type my drafts into Word or Scrivener so that at least I'll have a rough draft to fall back on if Blogger feasts on my finished, polished, prose. I'm going to take a day off from my Starburst Method series to talk about how to format a Word file for uploading to Amazon. I think everything I say will also be applicable to Smashwords but that platform may have one or two special requirements. When your Word file is formatted ready for upload to Amazon it will have several sections. Below are the most common ones I've seen. - Person or company that is copyrighting the work. 3. 'Plain language' explanation of your wishes regarding whether your book should be copied without your permission. 4. Link(s) back to your website or blog, social media sites, etc. - One or more authors telling prospective readers your writing is terrific. - Tell readers what your book is all about and hook them in 500 words or less. Many of these sections aren't mandatory and I've listed them here in no particular order. Yes, you'll probably want to start off with your title section, and certain sites will want you to put your copyright information up at the front of the book but, other than that, the order the sections come in is up to you. What follows is just what I do. If you decide to do it differently--for instance, place your acknowledgement section at the back instead of the front--that's great! Do what works for you and the book you're publishing. If you've never published a book before I'd suggest that you be kind to yourself, take things easy, and publish a short work and keep it simple. After you have one success under your belt and you're feeling bolder then start adding sections. So that's what I'm going to talk about. Publishing a simple, bare-bones document with minimal formatting. No bells and whistles. But, first, let's get a couple of questions out of the way. You don't need to have an ISBN number to publish your books on Amazon. It's easy to procrastinate publishing your first book because the process is unfamiliar and perhaps daunting. You can always get an ISBN number after you publish your story. The important thing is to publish it. I do think it's a good idea to buy a block of ISBN numbers from (if you're in the US) Bowker. Here's a link to Bowker's extensive FAQS. It is a common misconception to confuse copyright registration with the granting of copyright. If you want to be in a position to defend your copyright in court it's a good idea to register your copyright. Also, and as I'm sure you know, a number of sites pirate books--offer them free for download without the copyright holder's permission. If you find your book on one of these sites you have a chance of getting it taken down if you can provide proof of copyright. Whether you want to register your copyright is up to you. You can publish your book without doing so. It's conventional that the first program one writes in a new language prints out: Hello World! Or at least that was true in my day. This is our equivalent. We're doing this to get the hang of things and show ourselves this publishing thing isn't scary at all. So go through your writing, do you have a short story that is finished, beta-read, proofed, edited, typo-free with sparkling prose that's ready to be uploaded? Well, I'm at just over 1000 words so I'll end this post for today and pick it up again tomorrow. Update: Here is the second installment in the series: How To Format A Word Document For Uploading To Amazon: MS Word Styles. Have you ever published your work yourself? If so, what did you think of the experience? Was it harder than you expected? Easier? 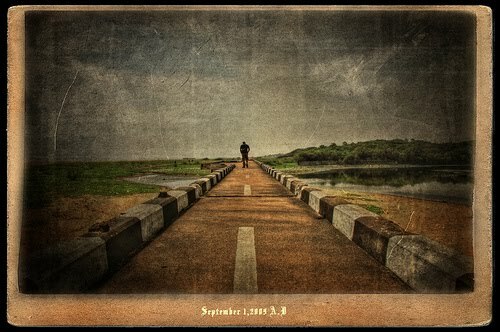 Photo credit: "Destination Unknown" by VinothChandar under Creative Commons Attribution 2.0. It's a shame Amazon doesn't allow Paypal. It's very hard for non-US authors, who aren't located in Germany or the Uk to publish via Amazon. I discovered this yesterday, when I made the createspace account and found no alternative to Paypal, that works for me, residing in Romania. In the same day I emailed their support in order to request the deletion of my account. I'll just have to leave it to the guys at Smashwords to deliver my stories to Amazon, after I make it into the SM 1000 seller club. Yes, it is too bad Amazon doesn't accept Paypal. Hopefully they'll add more payment options in the future.